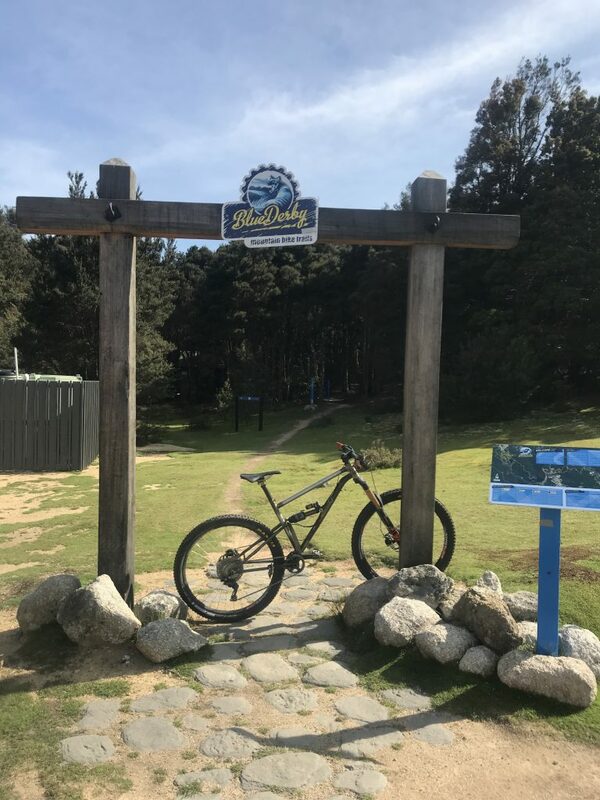 Last week I used an annual MTB getaway with a group of mates to test my first dual suspension mountain bike on the mind blowing trails above the Tasmanian towns of Derby and Maydena. Earlier this year I started playing around with some 2D sketch geometry in an attempt to get my head around suspension kinematics with the goal of coming up with my own design. 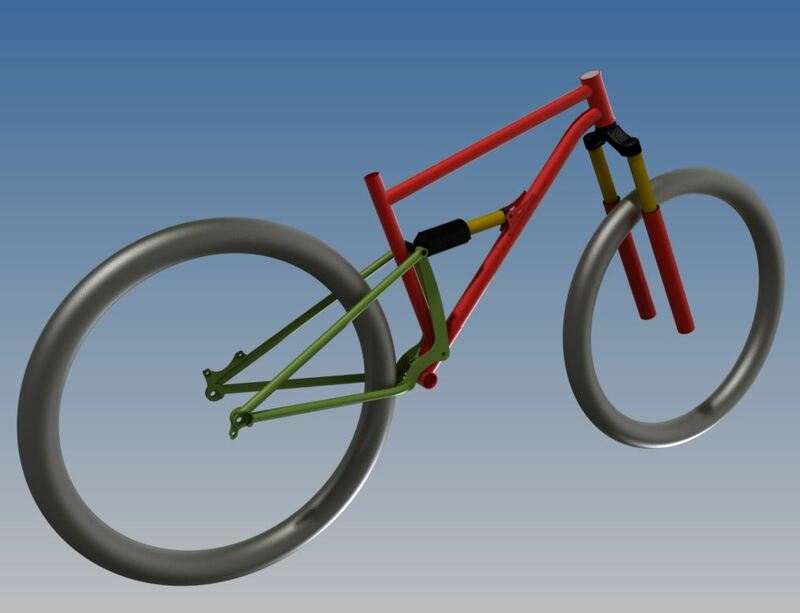 I kept things simple and started working on a good old fashioned, single pivot, solid swingarm, enduro bike with 150mm of travel front and back. I choose to prioritise suspension performance over pedalling performance which meant keeping anti-squat below 100% in all gears and rely on the Fox X2 climb switch to provide a pedalling platform for sustained climbing. 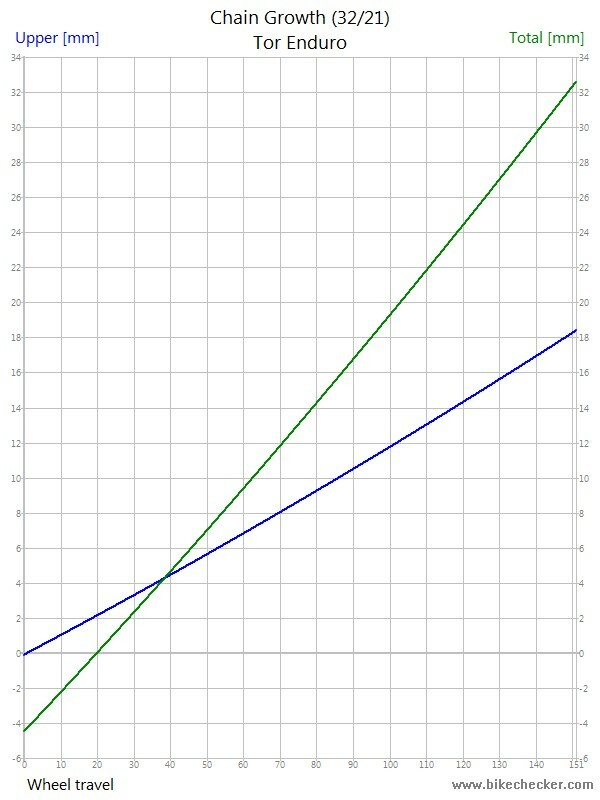 I aimed to keep the leverage curve close to linear and use volume spacers in the X2 to provide some progression toward the end of the travel. The swingarm pivot is located up and forward of the BB on the same radius as a 32T sprocket chainline which restricts total chain growth to about 18mm. Anti-rise ranges from 105% at the start of travel and drops to 92% at bottom out which means there is no significant brake induced extension or compression of the suspension. My hope was that these factors should see the bike avoid excessive brake jack that single pivot bikes are notorious for. 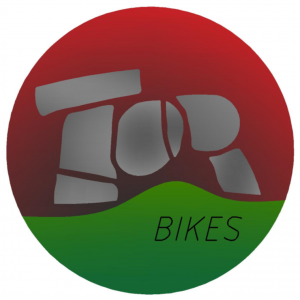 I decided upon 29″ wheels, head angle of 66°, chainstay length of 440mm and BB drop of 50mm which I believed would provide balance so that handling would be stable on fast and steep trail but nimble enough to tackle a tight switchback both up or down. 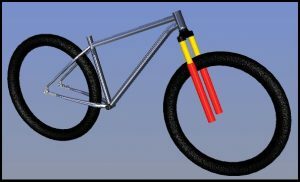 Now that I had some geometry it was time to design a bike. The front triangle is all Columbus Zona in combination with some specifically shaped gussets around the BB and shock mount to provide some stiffness and eliminate stress concentrations. The swingarm is made from straight gauge 4130 tube and some profile cut 1/8″ 4130 plate which allowed for a stiff, simple and shallow connection between chainstays and seatstays. My analysis showed that the thin 4130 side plates were plenty stiff enough to deal with the roughest off camber terrain and dodgy landings which satisfied my brain, but my gut was unconvinced. I trusted the numbers but had a bolt in aluminium stiffener designed just in case my gut feeling turned out to be correct. Controlling the heat around some of the thin gussets proved tricky during the brazing process so I’ll make some small changes for the next build. The pivot bore was machined post brazing to provide a precise housing for a slightly complicated arrangement of cylindrical needle roller bearings and needle roller thrust bearings. Time will tell if I stick with this. 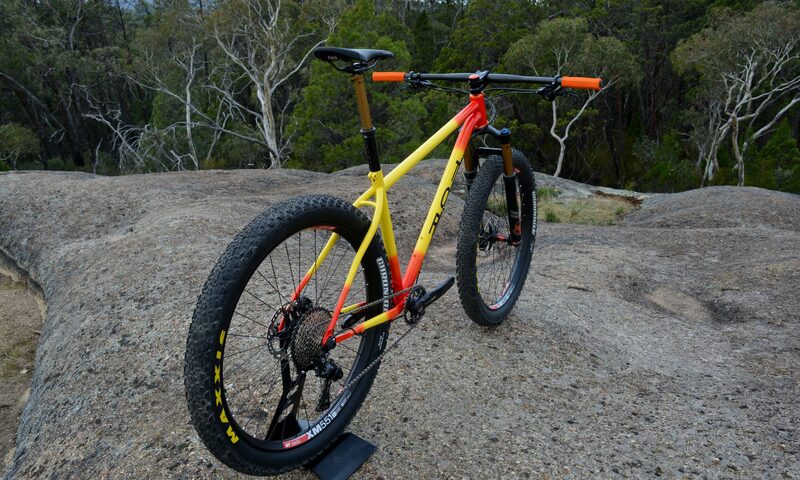 Travis from Beechworth Cyclery helped me turn the raw steel frame into rolling bike with 150mm Fox Factory 36 forks, Fox Factory Float X2 shock with climb switch, Fox Factory Transfer dropper seatpost, Chris King headset and hand built DT Swiss XM 481 rims on DT Swiss 240s front and back. I raided my spares bin to finish the build with full XT groupset, Thompson stem and Whiskey carbon bars. I’ve opted for the simplicity of full external cable and hose routing. I may consider internal routing in the future but for now it’s not a priority. The complete bike passed the foot to crank stiffness test so I left the back up swingarm stiffener off. How did it ride?… sick! I never say sick. The bike rode exactly how I had imagined it would. 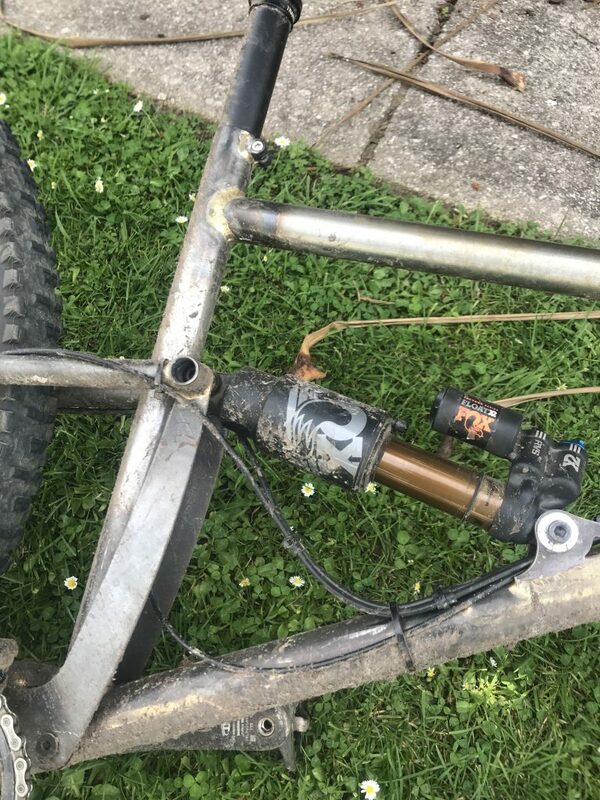 The EWS proven trails of Derby provided everything from the fast flow of Kingswall and Return to Sender to the gnar of Detonate and Trouty and even some fun pinchy climbing on Snig Track. The X2 climb switch transformed a 14.5kg bike designed to descend into an efficient climber in and out of the saddle. I was pleased to be able to keep up with mates on carbon trail bikes on the 3km 8% fire road climb for a second attempt at the Big Chook descent. The bike came alive when speeds increased and trails pointed down! The ride is buttery smooth, and grip was amazing. The lateral compliance which is often attributed to steel frames is amazing and very noticeable. Grip levels on fast sweeping turns, big berms and off camber seemed endless. When it came to the steep rocky tech of Trouty, Detonate and Shearpin the suspension was supple and seemed to remain active under braking. The bike was far more capable than I so I’d like to put in the hands someone with some proper skills and set them free. It didn’t bottom out but got close several times so I’m keen to experiment with some volume spacers in the X2. By the time we arrived at the Maydena Bike Park I was used to the bike and had confidence in its ability. Maydena is a slice of heaven on earth. The trails are long, steep, rough, tight and there are endless opportunities for air. I was letting off the brakes and taking high lines, inside lines, straight lines and jumping more than I normally would. I had confidence that would normally lead to spectacular crash. After 5 days and just over 10000m of descending the bikes performance had exceeded my expectations. What next? The cool raw steel appearance has transformed in to rusty farm machinery appearance so I need to strip it down, clean it up and get some paint on it. I will also check the frame alignment and inspect the pivot bearings. I’m hoping to have it back together soon and will start to experiment with the suspension and seek some feedback from other riders. I was having too much fun to stop and take any action photos but keep an eye on @tor_bikes for some images and video content. I’ll be displaying my 27.5+ steel hardtail at the Handmade Bicycle Show in Melbourne on April 27-29!